Last week’s post about jazz legend, Dave Brubeck, led to water cooler discussions and Facebook murmurings about additional jazz collaborations here at Cranbrook. Thanks to an inquiry on Facebook I discovered the great story of Yusef Lateef’s Cranbrook connection. Lateef was born in Chattanooga, Tennessee in 1920, but grew up in Detroit. After graduating from high school he began playing professionally in swing bands at the age of 18. 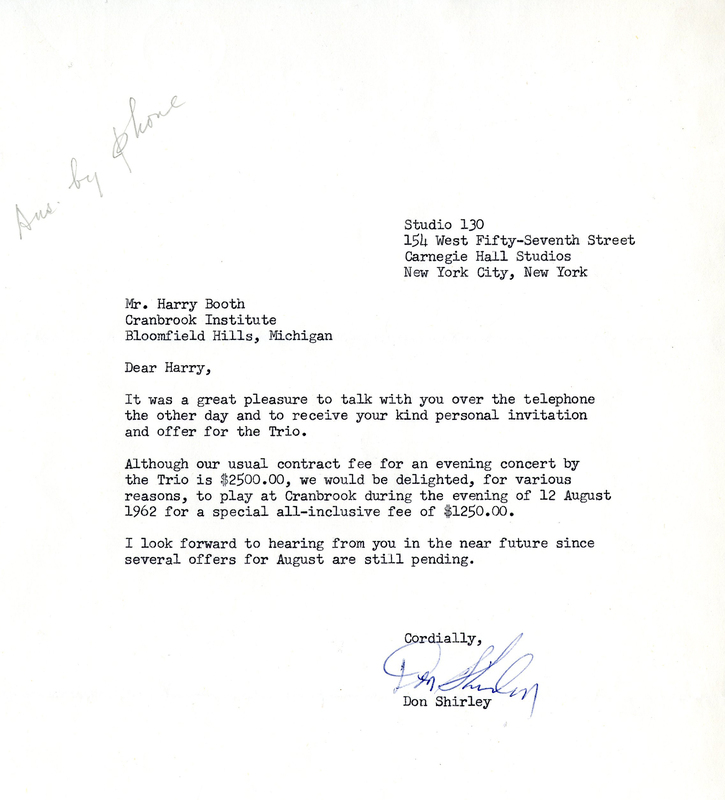 In 1949, he was invited to tour with Dizzy Gillespie and his orchestra. A year later, he returned to Detroit to begin his studies in composition and flute at Wayne State University. He eventually received his undergraduate and graduate degrees from the Manhattan School of Music and his Ph.D. in Music Education at the University of Massachusetts at Amherst. Lateef’s main instruments were the tenor sax and flute, though he played many other traditional and non-traditional instruments. 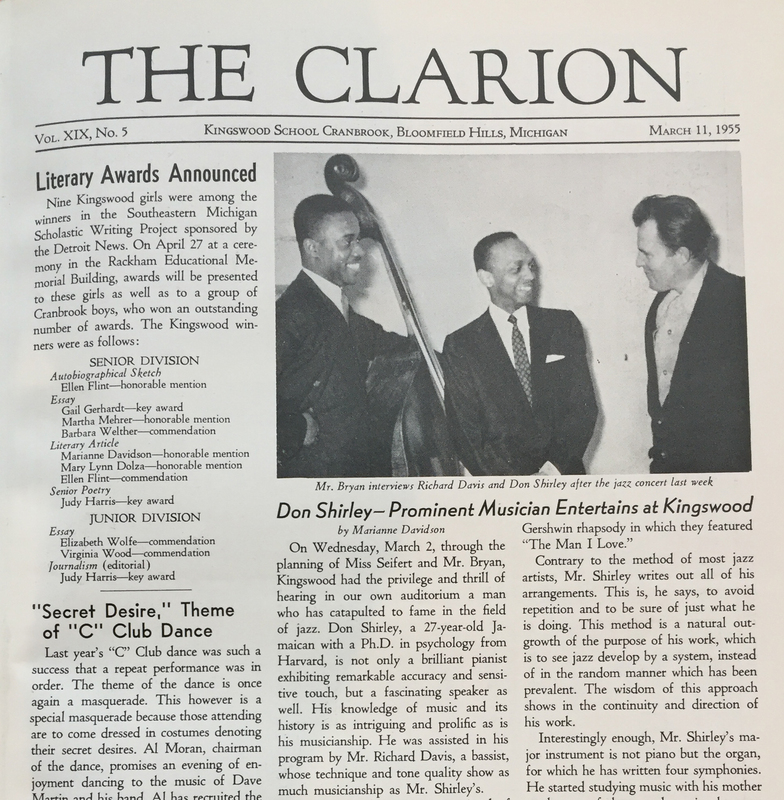 In the late 1950s, Lateef was invited to perform at Cranbrook by members of the Academy of Art Student Council. The Council thought it would be worthwhile for art students to learn something about another form of artistic expression – in this case, jazz. In April 1958, Lateef performed in the galleries at the Academy of Art. Seating capacity was limited and patrons sat on pillows on the floor. Promotional material for the jazz concert, April 9, 1958. Courtesy Cranbrook Archives. It turned out the students and Lateef were of one mind about the value of exchange between the arts, and agreed that the concerts should be held in the galleries, rather than an auditorium. Lateef had a reputation for experimental sounds, and the audience was treated to a concert that included non-traditional instruments, such as an inflated balloon and a 7-Up bottle. Pianist, Terry Pollard, plays the 7-Up bottle. Harvey Croze, photographer. Courtesy Cranbrook Archives. One of the great treats of this collaboration was a recording from that night! The LP, “Yusef Lateef at Cranbrook,” includes the following pieces: Morning, Brazil, Let Every Soul Say Amen, and Woody ‘N’ You. In 1988 Lateef received a Grammy award for Best New Age album and in 2010, he received the Jazz Master Fellow award from the National Endowment of the Arts. When Lateef passed away in 2013, he had recorded more than 75 albums. Yusef Lateef and his band perform in the CAA galleries. Harvey Croze, photographer. Courtesy Cranbrook Archives. For more than 60 years, the Cranbrook Music Guild has been providing chamber music to Oakland County residents. The Guild, started by a group of music lovers in 1951, wanted to promote and provide chamber music on the beautiful grounds of Cranbrook. Consequently, the first Cranbrook Festival was held during the summer that year. While the early years focused on presenting classical music, including performances by the Julliard String Quartet and the Detroit Symphony Wind Quartet, by 1959 the Guild members were looking to expand the roster and even included ballet in the summer program. Encouraged by the response during the 1959 season, the summer of 1960 featured the Michigan Chorale (a 100-mixed voice ensemble), the Severo Ballet accompanied by the DSO, and even a jazz concert in order to “present the best in all fields of art.” The first two performances were, as usual, held at the Greek Theatre. The third of the season was the Dave Brubeck Quartet. One Rochester [Michigan] News reporter called it “the Guild’s boldest experiment” to date. In anticipation of a capacity crowd, the performance was held at the football stadium at Cranbrook School instead of the Greek Theatre, which is a smaller venue. Dave Brubeck Quartet, Cranbrook School, July 14, 1960. Harvey Croze, photographer. Copyright Cranbrook Archives. In 1960, the members of The Dave Brubeck Quartet were Dave Brubeck (piano), Paul Desmond (alto saxophone), Joe Morello (drums), and Eugene Wright (double bass). The concert at Cranbrook was held on Sunday afternoon, July 14th at 4:30 pm. While the Guild was hopeful for a full house of 2,000, more than 1,100 people actually attended, still beating the Guild’s previous attendance record of 775. Cranbrook Music Guild Records. Courtesy Cranbrook Archives. Editor’s Note: Thanks to Chris Morton for bringing this event to our attention!